Damascus is built on the highest point in Montgomery County at 866 feet above sea level. The good news for homeowners in Damascus is that the high elevation of the town means there likely aren’t any subsurface sources of water affecting your home’s foundation. The bad news is that Damascus is still subject to the same weather conditions of the mid-Atlantic region. Between the increasingly unpredictable snow storms and nor’easters and the summer thunderstorms and hurricanes that can dump several inches of rain in the span of minutes, there is still plenty of water making its way to your home’s foundation after each storm. Why Is Water A Problem? Water is the root cause of most foundation problems. The weight of your home is supported by the soil on which it is built. The foundation’s role is to transfer the weight of the home to the soil beneath it. The soil underneath most homes is actually a mixture of several different types of soils, each with its own unique physical properties. When a foundation is built, all the soil is compacted before the foundation is built so that the soil is relatively stable. With a sudden influx of water, however, the different types of soil begin to expand and contract at different rates in response to the water. The uniformly compact soil does not stay that way, and the foundation can begin to move. 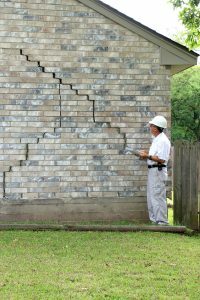 If you notice any of these signs, you may have a foundation problem, and you should call a company that specializes in foundation repair in Damascus right away. They can quickly diagnose the problem and suggest the most cost-effective solution. If you’re experiencing foundation problems due to excess water, it’s usually not enough to address the structural sinking or shifting of the foundation. Without a comprehensive water management strategy, you may find a new problem in the form of a leaky foundation, or your foundation may continue to move. Companies specializing in foundation repair Damascus can use several techniques to ensure that your foundation stays water free, depending on the severity of the problem. The easiest and cheapest solutions include installing gutter extensions and regrading the soil around the home to slope down from the foundation in all directions. These strategies ensure that excess water will drain away from the foundation, rather than pooling around near it. In some cases, this may be enough to solve the water problem in Damascus. In more extreme cases, you may need to install interior or exterior drainage systems. This method involves installing a system of drainage pipes around the interior or exterior perimeter of the foundation. The drainage pipes collect water approaching the foundation and reroutes it away from the foundation, sometimes with the aid of a pump. This is a fairly involved and expensive process, but if properly installed by professionals specializing in foundation repair in Damascus, they can ensure that your foundation stays water free. Another common problem for foundations experiencing an excess of moisture is a leaking foundation. Water can find its way inside your foundation through cracks in the concrete or simply through the pores in the concrete through capillary action and hydrostatic pressure. If your foundation has been leaking, there is a very good chance that there is mold and mildew growing in your foundation. The presence of mold and mildew will impart an unpleasant smell to the rest of your home, but more importantly, they can release spores and toxins harmful to human health into the air circulation of your home. It is imperative to remove not just visible mold, but all traces of it because even dead mold particles can continue to cause health problems. A company specializing in foundation repair in Damascus can provide mold remediation services in addition to foundation repair services, to ensure that every trace of mold is removed from your home. If you have a foundation problem or a leaking foundation, you should contact a foundation repair company right away to address the issue before more extensive damage occurs.